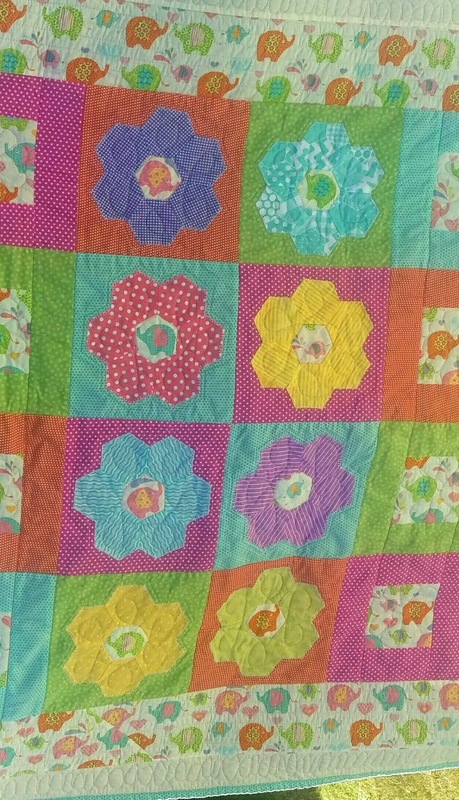 This fun little number involved fussy cuts, (which I had been wanting to try), hexies (which I also wanted to try) and I did quite a bit of free motion quilting. Much of this fabric has been used in other quilts, so no sheep had to loose their winter coats and I was feeling too lazy to drive all the way to the fabric store to purchase batting so I used a piece of ugly green fleece in between the top and bottom for warmth. So, I saved gasoline and got rid of an ugly piece of fabric that I'd probably never use for anything else. Yeh me! In case you don't know what fussy cut means...I didn't...it is just show-casing a cute design on a piece of fabric. In this quilt, obviously, it's the elephants. It often takes extra fabric because you have to cut out according to design. This is not a project for the faint of heart...in other words, not a beginner. But, if you've made a few quilts, you like hexies and you love to sew---then here you go!